Do you like Gwyneth's new vamped-up look? Do you have a complaint against this newspaper? 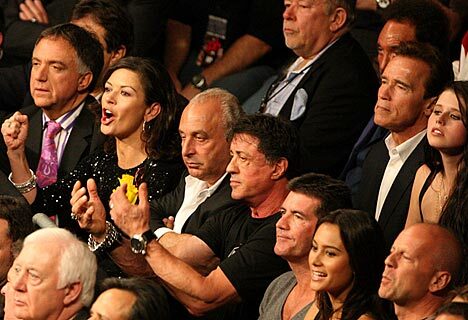 Hollywood star Catherine Zeta-Jones showed off her national pride in Las Vegas over the weekend, cheering on her fellow Welsh countryman Joe Calzaghe as he boxed his way to victory. With bright yellow daffodil pinned to her dress and a Welsh flag draped around her shoulders, the actress could barely contain her excitement as the "Pride of Wales" took on American boxer Bernard Hopkins. She was joined by a who's who roll call of A-list stars, including Tom Jones, sang his homeland's national anthem, Land Of My Fathers, before the 36-year-old entered the ring in front of more than 14,000 fans. Tom said: "To be singing on behalf of Joe is a privilege." 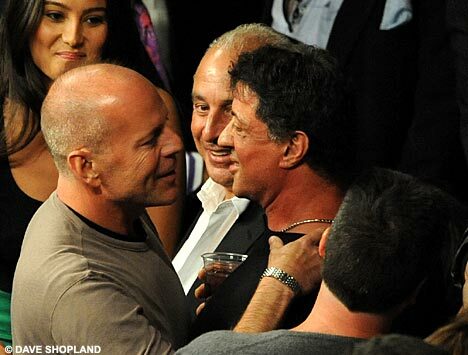 Former action heroes Arnold Schwarzenegger, Sylvester Stallone and Bruce Willis were also lined up to watch Calzaghe flex his muscle. 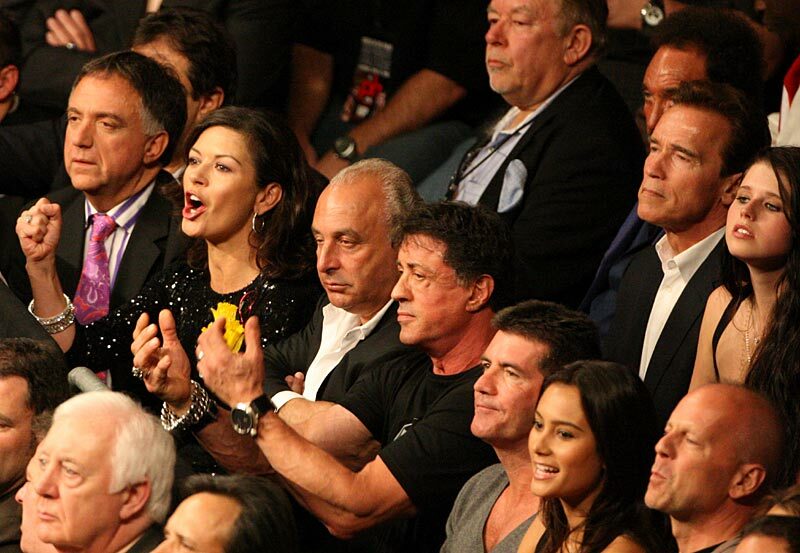 Reality television king Simon Cowell took a front row seat as did Topshop boss Sir Philip Green. Other ringside stars included music impresario Sir Andrew Lloyd Webber, 007 'Jaws' Richard Kiel, television host Cat Deeley, rapper Jay-Z, R&B star Brandy, actors Chris Tucker and James Belushi and tennis champion Pete Sampras. After the fight Joe, joined by his model girlfriend of four years, Jo-Emma Lavin and children Connor and Joe, celebrated his victory at Planet Hollywood hotel and casino on Vegas' famous Strip. Joe said: "I think we've proved tonight that Britain is at the top when it comes to boxing. I'll enjoy a nice beer or two and definitely spend time with the family." He recovered from a first-round knockdown to defeat Hopkins by split decision in a light heavy-weight bout in Las Vegas on Saturday. 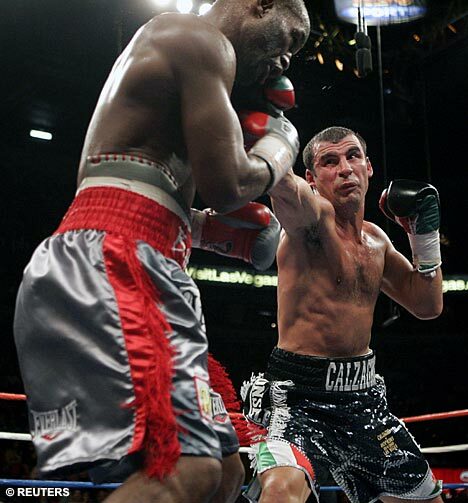 Calzaghe was awarded the bout on two of the three judge's scorecards, with him winning it 115-112, 116-111, 113-114. He showed little of his famed prodigious punch output in the first couple of rounds, as Hopkins gained the early initiative and knocked the Welshman down in the first round. By the third round, however, Calzaghe had become more active, looking to trap Hopkins in the corner or against the ropes and then unleash flurries of punches and his work rate counted for him in the end. "It was one of the toughest fights of my career," said Calzaghe. "He is very clever. He was so awkward. It wasn't pretty, but I won the fight. It wasn't my best night, but I know I won." For once, a British sportsman to be proud of. Well done Joe. make text area biggerYou have characters left. Remember me - this will save you having to type out your name, location and email address when you next leave a comment. Is it all a big show or is Katie Hopkins really pregnant? Is it the EastEnder for Pat Butcher after she's mown down in road accident?